In this beginner's pop-up workshop, participants will learn basic techniques in paper engineering by building a variety of versatile forms and lifts. Throughout the workshop, books of professional pop-up engineers will be examined. Participants will take home a collection of samples that can be used for further study and practice. Enrollment is limited to 10 participants, so sign up today! $70 includes materials - $60 student rate. To register, email southeastguild@gmail.com with your name, address and telephone. 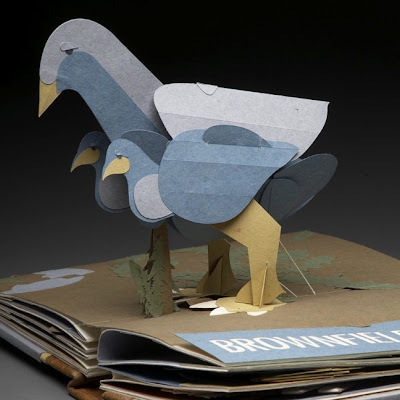 Shawn Sheehy merges his skills in paper engineering with an interest in themes of biological and cultural evolution to produce sculptural pop-up books. Shawn has taught workshops at PBI, Penland, and the Center for Book Arts in New York, and serves as designer for the poetry broadside series published by Oneiros Press. He earned a MFA in Book & Paper Arts at Columbia College Chicago. Register now for the GBW Standards of Excellence Seminar! The Guild of Bookworkers' annual Standards of Excellence Seminar convenes this year in Tucson, Arizona, October 14 to 16. This year's program promises to be enlightening and stimulating, with a full slate of excellent presenters (Michael Burke, Nancy Ruth Leavitt, Martha Little and Jeff Peachey), and tours of the beautiful San Xavier Mission, the Titan Missile Museum, the UA Center for Creative Photography, Arizona State Museum's conservation lab, and UA's School of Art. You can find information about travel and lodging, a schedule of events and presenter biographies here. Space is limited, so be sure to register soon here! This advanced critique workshop is for experienced book artists involved in on-going projects. Emphasis will be on creative problem solving and developing a realistic plan of work. $150 non-refundable registration holds your place in the workshop. At the Carlos Museum at on the campus of Emory University, preparations are under way to present two exhibitions on Islamic calligraphy and the Qur’an. Traces of the Calligrapher: Islamic Calligraphy in Practice, c. 1600–1900 and Writing the Word of God: Calligraphy and the Qur’an open Aug. 28. These complementary exhibitions — on view through Dec. 5 — examine the artistry of calligraphy, folios from the Qur’an, and the tools used to create these works of art, while exploring the social significance associated with calligraphy. For more information, see the Emory website here.